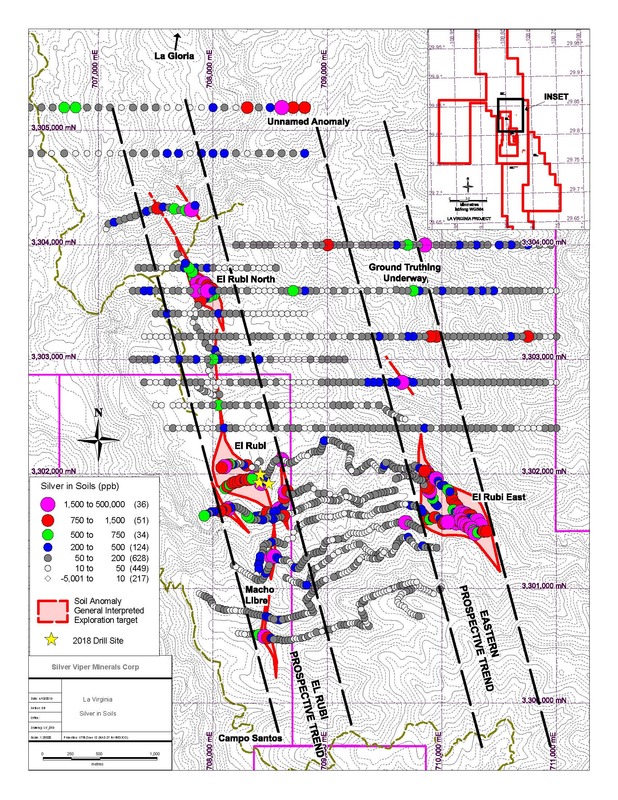 Silver Viper Identifies New Targets for Drilling at La Virginia Gold-Silver Project, Prepares for Helicopter-borne Magnetic and Radiometric Survey | Silver Viper Minerals Corp.
Vancouver, BC. Silver Viper Minerals Corp. (the “Company” or “Silver Viper”) (TSX-V: VIPR) is pleased to report ongoing surface exploration activities have identified additional follow-up targets at its La Virginia Gold-Silver project. Surface geochemistry and prospecting have identified targets to the north, south and east of the El Rubi discovery which will be tested during the next phase of drilling. In addition, Silver Viper has contracted Geotech Ltd. to conduct a 720 line-kilometer magnetic and radiometric survey over the El Rubi and La Gloria targets for a total coverage of 4,900 hectares. Both airborne survey and reconnaissance drilling are planned to coincide with follow up work at the El Rubi discovery area, due to commence in the coming weeks. La Virginia project is located in eastern Sonora, Mexico, 220km east-northeast of Hermosillo and is prospective for epithermal style gold and silver mineralization. Silver Viper’s regional surface exploration program was designed to advance geochemical and geological coverage in areas of little or no previous exploration activity. Mineralization recognized to date is controlled primarily by the regional scale north-northwest trend of the Sierra Madre which dominates the topography of much of western Mexico. The new targets are all located within the general area referred to as El Rubi, located north of the main La Virginia work area and south of the La Gloria target. A map showing surface geochemistry is available at silverviperminerals.com and below. The work follows drilling success in the late 2018 drill testing at El Rubi, a never-before drilled prospect located north of the historical La Virginia exploration targets. As previously announced (Jan 14, 2019), drilling at El Rubi returned a best result of 13.3m core length(estimated true width 6.0m) averaging 3.16g/t gold and 228g/t silverfor a gold equivalent1 grade of 6.42g/t gold. Drilling to date has encountered mineralization over a 100m length, with planned work designed to increase the known limits. Dale Brittliffe, P.Geo., Vice President of Exploration is the ‘Qualified Person’ under National Instrument 43-101 and has approved the scientific and technical information contained in this news release. Information set forth in this press release contains forward-looking statements. These statements reflect management’s current estimates, beliefs, intentions and expectations; they are not guarantees of future performance. The Company cautions that all forward looking statements are inherently uncertain and that actual performance may be affected by a number of material factors, many of which are beyond the Company’s control. Such factors include, among other things: risks and uncertainties relating to exploration and development, the ability of the Company to obtain additional financing, the need to comply with environmental and governmental regulations, fluctuations in the prices of commodities, operating hazards and risks, competition and other risks and uncertainties, including those described in the Company’s financial statements available on www.sedar.com. Accordingly, actual and future events, conditions and results may differ materially from the estimates, beliefs, intentions and expectations expressed or implied in the forward-looking information. Except as required under applicable securities legislation, the Company undertakes no obligation to publicly update or revise forward-looking information.